A review of the Global Solutions Summit in March in Berlin. An interview with Amine Kharrat during the Global Solutions Summit 2019 in Berlin. Four steps how the Federal Government can be at the forefront in implementing the Global Compact for Migration. Refugee management in Africa is hindered by scarce resources, social tensions, and cumbersome regulatory processes. Displacement: Worldwide, more people are leaving their countries of origin than ever before. 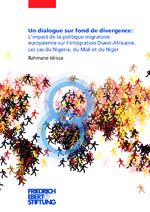 Migration: Migration is to be expected in an interconnected and globalized world. Integration: How do we want to live together in a diverse society with peace, safety and equal participation for all? There are various reasons why people flee from their homes. Understanding the causes of migration is a precondition for reducing them. We want a dialogue with refugees! So we facilitate building networks between refugees, representatives from politics, public administration and civil society. We need public policies to tackle the integration of refugees. Now is the time to come up with ideas for policies that facilitate integration and equal participation.